In this day of oil wars, peak oil (and the accompanying soaring prices), climate change and oil spills such as the one in the gulf by BP, it’s more important than ever to promote sustainable alternatives such as hemp ethanol and biodiesel. Hemp turns out to be the most cost-efficient and valuable of all the fuel crops we could grow on a scale that could fuel the world. To clarify further, ethanol is made from such things as grains, sugars, starches, waste paper and forest products, and methanol is made from woody/pulp matter. Using processes such as gasification, acid hydrolysis and enzymes, hemp can be used to make both ethanol and methanol. Bio-diesel is made from oils and fatty acids in plants and animals. Hemp biodiesel is the name for a variety of ester based oxygenated fuels made from hemp oil. The concept of using vegetable oil as an engine fuel dates back to 1895 when Dr. Rudolf Diesel developed the first diesel engine to run on vegetable oil. Diesel demonstrated his engine at the World Exhibition in Paris in 1900 using peanut oil as fuel. Even Henry Ford built his first cars to run on Bio-diesel. 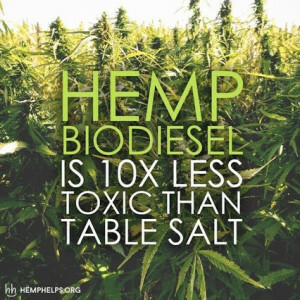 Hemp biodiesel comes from the pressing of the hemp seeds to extract the oil. Through a process explained here, hemp biodiesel can be made. Biodiesel is the only alternative fuel in the US to complete EPA Tier I Health Effects Testing under section 211(b) of the Clean Air Act, which provide the thorough inventory of environmental and human health effects attributes that current technology will allow.